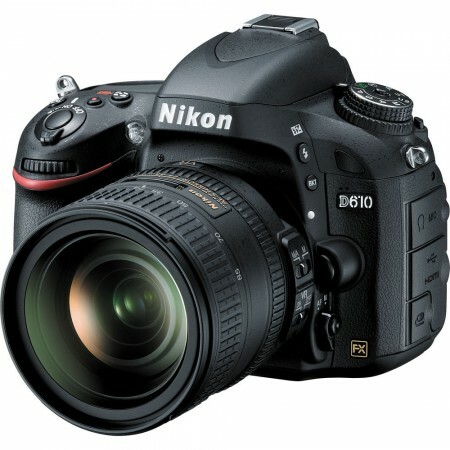 The new Nikon D610 Full-Frame (FX format) DSLR camera has just been announced. This camera features a faster 6-fps shooting rate and 39-point AF. Nikon Corporation is pleased to announce the release of the D610, its latest Nikon FX-format digital SLR camera. The D610 offers an effective pixel count of 24.3-million pixels, the superior rendering capability of the Nikon FX format, as well as the mobility of high-speed continuous shooting at approximately 6 fps*1. Despite its compact size and light weight, it is capable of the rich expression of tones, broad dynamic range, and low noise characteristics with shooting at high sensitivities expected of an FX-format camera. It also offers the beautiful blur characteristics, and superior image quality and rendering performance that challenges that of top end models like the D4, D800, and D800E. What’s more, its compact and lightweight body is loaded with a number of features that give it excellent basic performance, including an optical viewfinder with frame coverage of approximately 100%, double SD memory card slots, top and rear covers made of magnesium alloy, and a function for recording time-lapse movies. It is also equipped with a new quiet continuous release mode that supports continuous shooting at approximately 3 fps*1. Its 39-point AF system supports certain acquisition and tracking of the intended subject, and the 9 most frequently used focus points at the center of the frame utilize cross-type sensors for greater accuracy. In addition, autofocusing is possible with lenses that have a combined maximum aperture of f/8 or faster using 7 focus points at the center of the frame (3 vertical and 5 horizontal; center focus point utilizes cross-type sensor), enabling highly precise autofocusing even when a super-telephoto NIKKOR lens is used with a teleconverter. The D610 is also equipped with a built-in flash that covers the angle of view of a wide-angle 24mm lens and has a guide number of approximately 12/39 (m/ft, ISO 100, 20°C/68°F). The built-in flash is equipped with a commander function that allows it to be used as a master flash able to wirelessly control the optional Speedlights SB-910 and SB-700 as remote units. This capability allows users to easily enjoy creative expression with varied lighting options. The D610 also offers users powerful support for their photography with excellent system expansion using a variety of accessories, including the Wireless Remote Controllers WR-R10 (transceiver) and WR-T10 (transmitter) for simple and enjoyable remote operation, and the Wireless Mobile Adapter WU-1b, which enables simple sharing of full-size images exhibiting the superior image quality of the D610 with a smart device. As a compact system that is easy to manage and use, the D610 is a Nikon FX-format model that a broad range of users, not just professional or advanced amateur photographers, will enjoy.